A new sleep apnea oral appliance can be fitted and used at home without going to a dentist called ApneaRx! 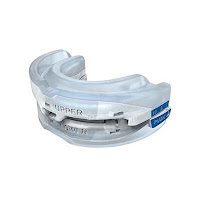 Oral appliances to treat obstructive sleep apnea (OSA) have an upper and lower component that fit into the upper and lower jaws. A mechanism within the device than allows for the lower jaw to be thrust forward to some degree which pulls the tongue and anterior airway forward thereby enlarging the airway and preventing obstructive apneas during sleep. It can also help with snoring. 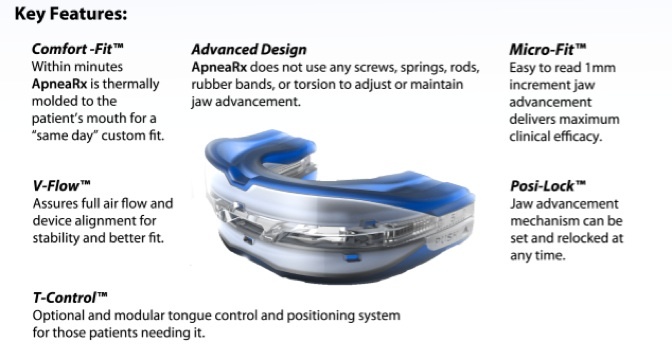 Typically, such OSA oral appliances must be fit by a dentist and cost upwards of $300 or more. That's where this new OSA oral appliance called ApneaRx comes in which is considered a "transition" device to try and see if oral appliances will work for a given patient before going with an expensive dentist-fit customized oral appliance. In essence, the device is heated and bitten into for fitting. The device can than be adjusted in 1mm increments by squeezing from the sides. If this device "works" for a patient, they can either continue to use this device, or now take the time and expense of getting a customized device from a dentist. However, please be aware that there's only one size currently available which may be too large for 20% of patients, especially women. There will soon be a smaller version for those with a smaller mouth by the end of 2012.